Venus shines near the limb of the crescent moon during a lunar occultation on May 16, 2010 as seen by skywatcher Joe Chan Yuen Fai in Kennedy Town, Hong Kong. Full Story. Striking new photos from a skywatcher in Hong Kong show the Earth'smoon appear to swallow Venus during a weekend cosmic event. The Venus and moon photos were taken by skywatcher JoeChan Yuen Fai on Sunday, May 16 in Kennedy Town, Hong Kong, during a lunaroccultation ? an event in which the moon obscures a more distant star or planet. "Seeing both Venus and moon hanging on the sky isnot surprising for me, but I was excited by the phenomenon," Yuen Fai toldSPACE.com in an e-mail. "The moon ate the planet Venus!" The reflection of light from Earth, known as "Earthlight,"fills in some of the shadowed area of the moon, as well. "At the beginning, Venus and moon were so close toeach other. People around me wondered what the bright star hanging above themoon was," Yuen Fai said. "But then the bright Venus became dimmer asit moved closer to the moon, and finally disappeared within a few seconds. ?Around25 minutes later, Venus appeared at the right hand side of the moon, and theyformed a picture which looked like a sickle!" 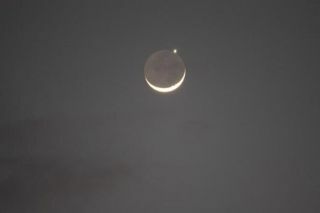 Yuen Fai said he used a Canon 450D camera with 18mm-55mmand 55-250mm Canon zoom lenses to photograph the moon and Venus. Venus is not the only planet being visited by the moon inthe night sky this week. Starting Wednesday night, the moon can be seen with Mars,Saturn and the bright star Regulus as it moves across the southwestern sky. Thissky map shows how to spot the cosmic sky show, which begins May 19 and endsMay 22.